With the rise in popularity of micro needling – or derma-rolling as it’s also known – aesthetic nurse prescriber, Carly Pearce, cautions against to DIY options. There has been great interest in the use of dermarollers and their benefit to the skin. But, be warned, home dermarollers should be purchased with caution. There are varying qualities available on the market and you need to check that the device is sterile, that the needles are the correct length and are of a high quality. After a quick search for dermarollers online, I found a triple pack for £13.99. The needle depths of the rollers in the pack were 0.5mm, 1.0mm and 1.5mm. And there are a few issues here. I was trained to recommend home roller devices of 0.1 and 0.3mm needle depth. A deeper needle is not appropriate for home use. Without the correct sterilisation of your skin and the roller itself, you could cause an infection. The deeper needles may cause an increased amount of trauma and even damage skin. There is a specific technique to rollering in order to achieve optimum results and to perform the procedure safely. The devices I saw are not sterile. You have no idea how they are made or where they have been stored – so who knows what bacteria you could potentially be needling into your skin. As the devices are extremely cheap, it is highly unlikely that the needles will be of a good quality. However, a high quality home dermaroller device might be of benefit to the skin by stimulating the epidermis with a short needle length. Aestheticare offers the HC9 Dermaroller device – a home care roller. This ethical company uses German engineering to produce high quality devices and it can be purchased from reputable clinics. This treatment creates vastly different effects to a home roller. The needle depths are greater and this accounts for the increased effect on the skin. The rollering process creates micro channels of needling, causing a small trauma to the skin to then wake up the cell cycles that go on to stimulate collagen production. This process takes time and a protocol of three treatments – six to eight weeks apart is normally recommended. If the person has scarring or pigmentation, more sessions may be beneficial. There are again varying levels of quality for clinic devices. Try not to be lured by the discounts – it is your skin and you want it to look it's best. Think sterility, quality of roller and the experience of the practitioner. Micro needling can be performed on most areas; the most commonly treated being the face, neck, décolleté and hands for rejuvenation, pigmentation and acne scarring. I have used the Genuine Dermaroller for the treatment of stretch marks and have seen dramatic improvements in them. I always point out at the consultation that there are no guarantees and the time the results take may vary from person to person. My clinical experience has been hugely positive in helping clients change their confidence levels by improving acne scarring, pigmentation, stretch marks and creating luminous and glowing skin. 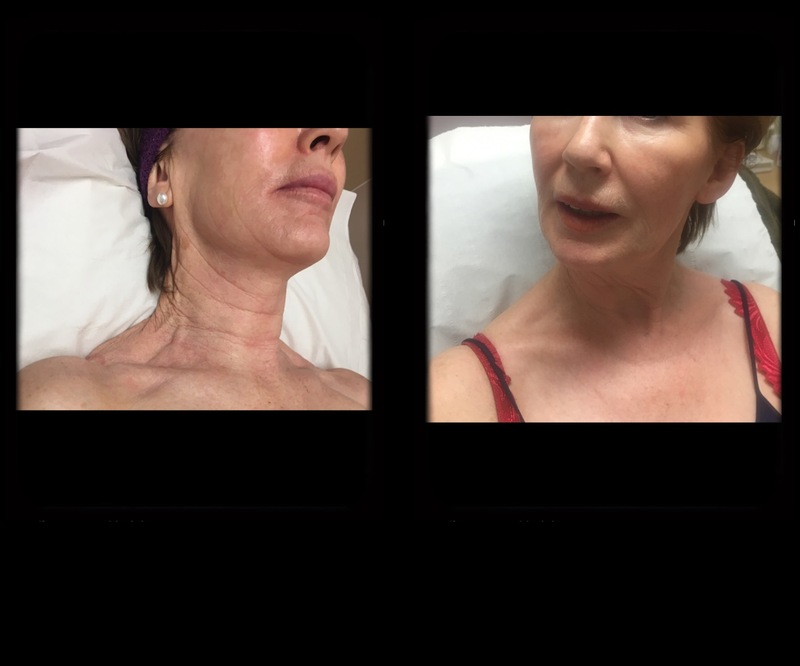 Pictured is a lady who had the electronic Dermastamp treatment for rejuvenation of the face, neck and décolletage areas. The EDS is the next generation in micro needling and is a machine version of the Genuine Dermaroller. It provides a more comfortable treatment and is one that can be adapted to the different areas of the skin or according to skin need and client comfort levels.